When Apple launched Swift it claimed that this language would allow everyone to build amazing apps. The language is marketed as easy-to-learn-and-use even if you have never coded before. So, all that’s required is a great idea to get you started and creating your own iOS or Mac apps. But how did Swift perform during its first six months of life? Well, RedMonk’s Stephen O”Grady has an answer for you. 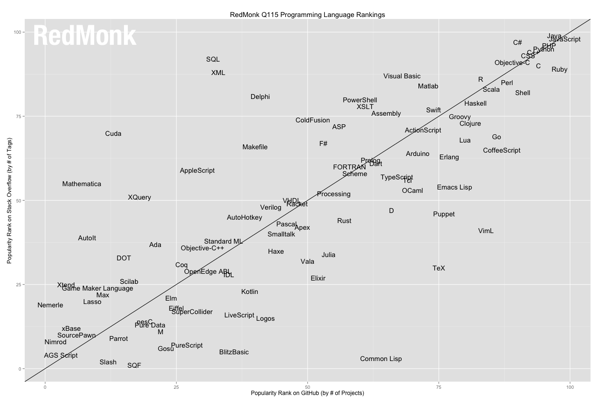 Since 2010 RedMonk has been regularly comparing the relative performance of programming languages on GitHub and Stack Overflow, and because two quarters have passed since the last rankings update, it is the perfect time to see how Swift ranks after its launch (via Fortune). According to data compiled by RedMonk, Swift’s usage growth is unprecedented in the history of these rankings. In numbers, this means Swift has jumped 46 spots from its initial 68th ranking in Q3 to 22nd in the December quarter. From its position far down on the board, Swift now finds itself one spot behind Coffeescript and just ahead of Lua. As the plot suggests, Swift’s growth is more obvious on StackOverflow than GitHub, where the most active Swift repositories are either educational or infrastructure in nature, but even so the growth has been remarkable. Given this dramatic ascension, it seems reasonable to expect that the Q3 rankings this year will see Swift as a Top 20 language. That’s an amazing performance. We’ll see when it gets to the top 10.